FlossieBlossoms: DQS8 is about to begin! DQS8 is about to begin! DQS stands for Doll Quilt Swap, something I didn't know until last week, when I got talked into joining it by my friend, Dena. I am SO glad she was persistent, because it's going to be great fun, I can already tell. This is being held over at Flickr. Here's how it works- 160 or so people signed up. A number of "swap parents" are given a group of about 20 quilters and their questionnaires that they filled out. It's up to each Swap Mama or Papa to assign a person to receive another person's doll quilt, which is between 12" x 12" and up to 24" x 24", any shape or size in between. They aren't partnered, though, so while I'll be assigned to make a doll sized quilt for someone, a different person will be making one for me. So it's all a surprise, no one knows who they are getting from. Doesn't that sound fun? It's going to be torture, though, because all along the way, quilters will be showing their quilts in progress, or sneak-peeks of them, to tantalize and make the others drool, but since you don't know which one is for you, they could any of them be for you! 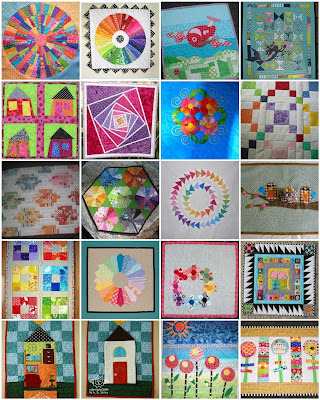 In order to make a quilt for your recipient that you think she/he will like, you have to stalk them at Flickr, or at their blog, being sneaky and stealthy so they don't know why you are there. You look at the things they've made, the things they've marked as a favorite, you look at their personal photos, if you can and see how the decorate their home, etc. You basically get to pry! lol I'm up for this task, somedays I think I should have been a private detective or a cop, anyway. :) And I'm marking a lot of people as contacts, so just because I might have marked YOU, that does not mean that you are the person I am making a little doll quilt for! And you also have to leave clues for the person who is making YOU a quilt. So here we go- clues! The photo above is a mosaic of some of my favorite doll quilts that were made in prior swaps. I just love these. And in my profile on Flickr, I've made a list of the things that please me the most. Hopefully it's enough to give my "maker" some clues and hints, but if not, maybe someone could give me a heads-up to be more specific. I'm pretty much an open book, though, and not what you'd call "deep" so I should be easy enough to get a handle on. Today we get the name of our recipient. I can't hardly stand it, I'm already having fun with this! You'll have fun. I can't wait to see what you make and what you receive. Me, too Needled Mom! I wish I had a clue of what to make, my person is going to be hard, I think. Thanks so much Susan, you're very kind! Who is the other person, I'll go stalk her just for fun and practice! Flickr is a lot easier to use than Facebook, IMO. Hey there Flossie, followed you over from Dena's blog! Your birdie quit looks great! You shouldn't be too worried that they won't like it, I am sure they will.. they'd be bonkers not to ;) Oh and I love Parker's mankey pink pads. I used to have an all white cat named Snowball.. I loved that cat, he was always getting into mischief. Isn't the dqs8 fun - we have many similar favourites!! You'll do something amazing, I'm sure!!! I'm having a ball! And I want one of everything. Wish I knew which quilty NOT to make! Hint, hint! Thanks, Stephanie, you're so sweet. I hope Mary and Karen are having as much fun as I am! I NEED a color wheel really badly!